Captured at El Dorado Park, in Long Beach. Please visit James, at http://newtowndailyphoto.blogspot.com/, to see who else posted a reflection or two. Swans are so elegant. Nice photo. The swans in Auckland are black. your closeup is so beautiful. I have taken many photos, but yours is really fantastic. Swans make for such a great reflections.Super choice Jan.
Gorgeous swan image! The colors and patterns in the water are beautiful. Simply beautiful. Swans make such nice pictures and the reflection makes it even nicer. O how stunningly beautiful! The ripples, the reflections and the swan make an exquisite scene! What a beautiful shot! I have a special place in my heart for swans ~ when my sister passed away last February she was having visions and was telling me about all the hundreds of swans that she could see swimming on the river. Of course there were none; she was in a hospital room with a little window that didn't overlook a park or river or anything of interest. 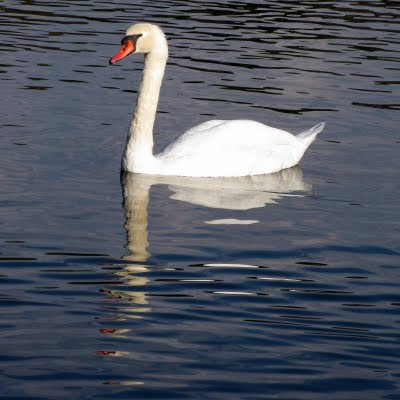 So now when I see swans... they remind me of her and her final moments here on Earth. Thank you for sharing.